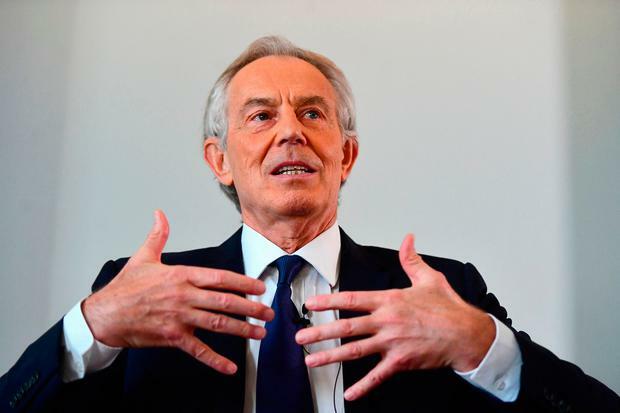 Former UK prime minister Tony Blair said any second Brexit referendum should be a choice between remain and a hard Brexit. Speaking on ITV’s Good Morning Britain on Monday, the former Labour leader said a second people’s vote was the only way to settle the deadlock in Parliament. Mr Blair, who is in favour of a second vote, said the choice should be between a hard Brexit or staying in the European Union. He said Prime Minister Theresa May’s deal did not please Brexiteers or Remainers. He added: “The only way to resolve this is to have the option remain or leave, but leave on terms that make it clear this is hard Brexit. Meanwhile, it has been reported that Theresa May’s chief Brexit adviser secretly warned her that the Northern Ireland “backstop” agreed in her deal with Brussels was a “bad outcome” for Britain. In a letter to the UK Prime Minister, Oliver Robbins said the backstop, intended to prevent the return of a hard border with the Republic, would mean the imposition of regulatory checks between the North and the rest of the UK, according to The Daily Telegraph. The disclosure will add to the pressure on the Prime Minister at the start of another difficult week as she battles to save her Brexit deal ahead of the crucial Commons vote on December 11. The paper, which said it had been passed details of the letter by a “concerned minister”, said Mr Robbins had advised there was no legal “guarantee” Britain would be able to exit the backstop, potentially leaving the UK tied to EU customs arrangements. The leak is likely to intensify demands for the Government to release the full legal advice on the Withdrawal Agreement if it is to avoid a major constitutional battle with Parliament.